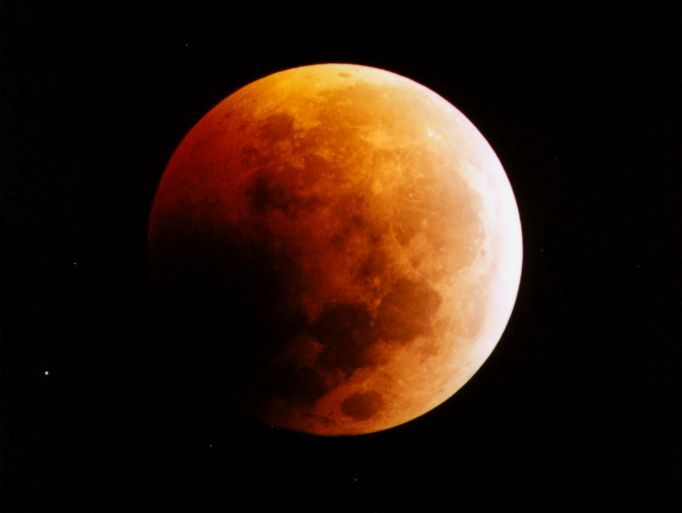 The lunar eclipse of May 15, 2003, was visible from North America and well-placed especially for the Eastern half of the United States. The eclipse was already in progress (partial eclipse) when the moon rose above the horizon here in Arizona. This photograph was taken 5 minutes before the end of totality. The moon's path moved through the northern part of Earth's shadow, and the eclipse was not central. Thus, the left-most part of the moon shown in this photograph (the southern limb) was deeper in the shadow. As a result, the right-most portion of the moon shown here (the northern limb) appeared much brighter. At maximum eclipse, the moon's southern limb passed 8.6 arc-minutes from the center of Earth's shadow, while the northern limb was 25.3 arc-minutes from the center. Unlike a total eclipse of the sun, where totality may only last 2 or 3 minutes, the duration of the total phase of this lunar eclipse was one hour and 37 minutes. The moon was only half a day past perigee, so the apparent size of the moon was relatively large (33.4 arc-minutes). During totality, the sky was filled with stars. The brightest star to the lower left of the moon in this photo is SAO 159330, a 5.5 magnitude star that was readily apparent during the total eclipse. During the one hour and 10 minutes between the end of totality and the end of the final partial phase of the eclipse, it was interesting to watch the sky go from a dark sky filled with beautiful stars, to a washed-out light polluted sky with only a handfull of the very brightest stars still visible. The change in the sky caused by the light of the full moon was dramatic. The photograph was taken with a Takahashi FS-128 refractor at prime focus operating at f8. The scope was carried on a Takahashi NJP mount. Kodak Royal Gold 400 film was used in an old 35mm Nikon F2 camera.